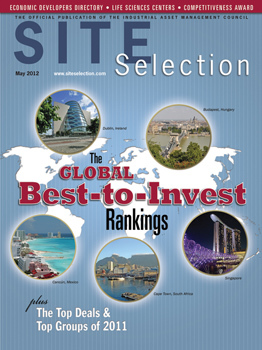 ite Selection is pleased to present its fourth annual Best to Invest rankings of nations and metro areas for investment-attraction activity in 2011. The national Investment Promotion Agencies recognized here were particularly successful in 2010 at attracting capital investment projects — both expansions of existing facilities and new projects — from investors at home and abroad. This year, Site Selection is proud to welcome the participation of Amsterdam-based FDI advisory Investment Consulting Associates (ICA) and its LocationSelector.com FDI software solution, a comprehensive suite of market analysis tools and research used by corporate executives and site location experts worldwide. The national Best to Invest rankings are determined 50 percent by LocationSelector.com-supplied analysis in these categories — business environment, business risks, foreign direct investment and infrastructure; and 50 percent by new and expanded facilities announced in 2011 and tracked by Site Selection publisher Conway Data Inc.'s (CDI) New Plant Database. The Best to Invest metros rankings were determined 40 percent by LocationSelector.com-supplied analysis in the areas of business environment, business risks, foreign direct investment, infrastructure and accessibility; 20 percent on an unscientific survey of global site consultants; and 40 percent on New Plant Database projects. CDI has been tracking project data for nearly six decades. The New Plant Database is the basis of much of Site Selection's editorial content throughout the year. It is the foundation of such prestigious honors as the Governor's Cup (March issue), the Competitiveness Award, Top Economic Development Groups and Top Deals (May), Canada's Top Locations (September) and Top State Business Climates (November). Projects resident in the New Plant Database meet one or more of these criteria: a minimum investment of US$1 million, creation of 50 or more new jobs or new construction of at least 20,000 sq. ft. (1,860 sq. m.). Site Selection is grateful for the time and information invested into this ranking by ICA, and we salute this year's winning national investment agencies and the metro areas globally that in 2011 could not be beat. (l. to r. ) VW's transparent factory in Dresden, Germany; South Jeollanamdo Province's first foreign school in Korea; Coca-Cola Hellenic's new complex in Northern Ireland, SP InfoCity in Chennai; GKN Driveline's machining facility in Celaya, Mexico; Iskandar's future HQ, Nusajaya, Malaysia; GCL-Poly's polysilicon complex in Jiangsu Province, China; Moree Solar Farm site, New South Wales, Australia; Covidien's facility in Shanghai; new UN headquarters in Nairobi, Kenya; Siemens City in Vienna, Austria. Images courtesy of (in order) VW, Invest Korea, Coca-Cola Hellenic, SP InfoCity, Pickard Chilton, GKN Driveline, GCL-Poly, CSIRO, Covidien, UNEP, Siemens. AECOM’s master plan for the 2016 Olympic and Paralympic Games in Brazil shows the Rio Olympic Park area during the Games (top) and afterward, in legacy mode. The 300-acre (121-hectare) site is located in district of Barra de Tijuca, southwest of Rio de Janeiro.